An in-depth comparison of Fuji’s FUJINON XF 56mm f/1.2 R and their FUJINON XF 60mm f/2.4 R Macro, including handling, sharpness, bokeh, aberrations, etc. The FUJINON XF 60mm f/2.4 was one of the three original lenses released with the Fujifilm X-Pro1. It has always had excellent options, but was plagued by slow autofocus speeds and for many, too small a maximum aperture. Newer cameras (X-T1 onwards) and Fuji’s regular firmware updates have made improvements to the autofocus pace, but the size of the aperture wasn’t about to change. That’s where the XF 56mm F/1.2 comes in. This was the fast 85mm equivalent Fuji fans have been waiting for to round out their prime kits. At f/1.2 it’s much faster, but it’s also bigger, heavier, and significantly more expensive. 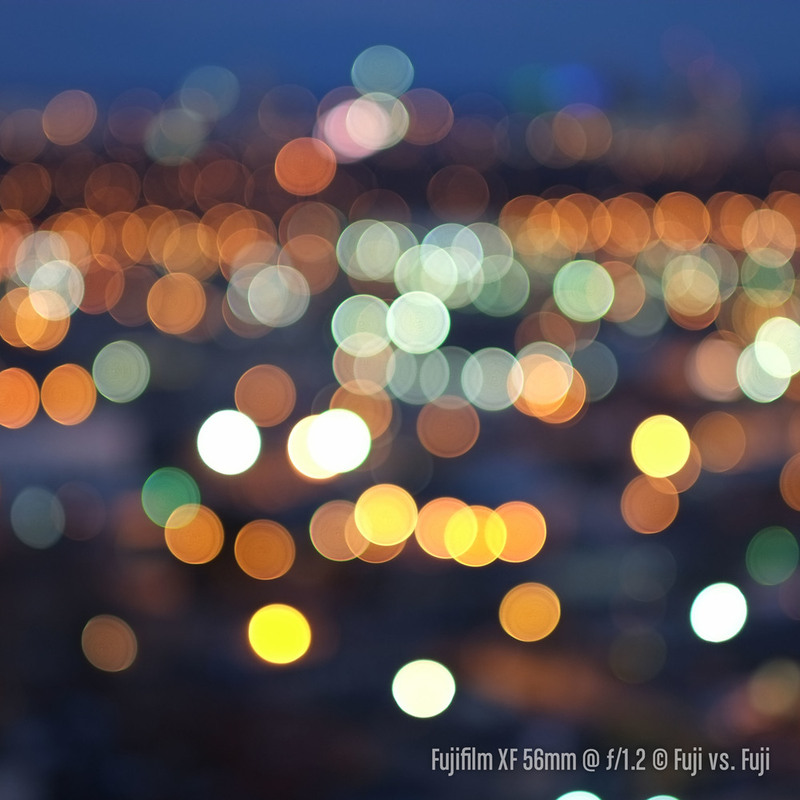 Are these tradeoffs worth the creamy bokeh making goodness of an f/1.2 aperture? Read on to find out. The usual array of manual, warranty card, and oversized pouch are included with each lens. It’s unfortunate that after Fujifilm released their first 3 primes, they moved away from the more premium, magnetized and foam padded boxes for the lenses. I remember cracking open my XF 35mm F/1.4 and really feeling like I was opening something special. Now we’re back to the standard fast-food drink tray material used by many camera manufacturers. Ultimately it doesn’t really matter, but the importance of first impressions can’t be denied. There’s a reason why unboxing videos became a thing. 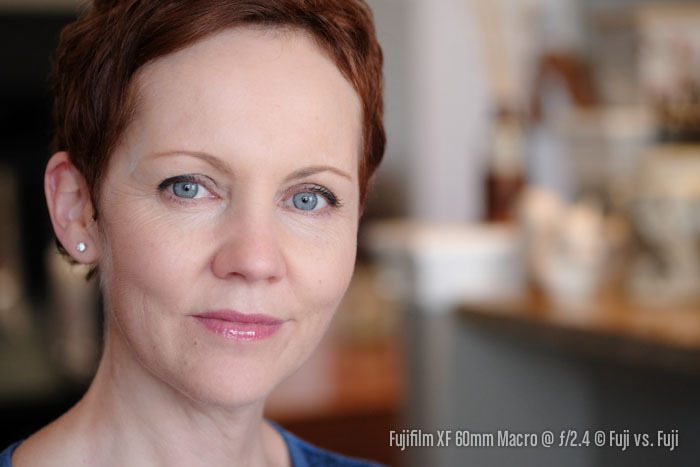 The XF 60mm F/2.4 Macro is significantly smaller and lighter compared to the XF 56mm F/1.2. So much so that size and weight alone may be reason enough to opt for the 60mm. If you’re looking to build a Fujifilm system that’s as light as possible and includes a “portrait” lens, the 60mm f/2.4 is it. With the hoods mounted, the lenses end up being almost exactly the same length, and the weight evens out a little bit too, thanks to the superior, but heavier metal hood on the XF 60mm F/2.4 Macro. I’ve done a lot of work with off-camera flash, and there has been instances of the XF 60mm F/2.4 Macro lens falring with the hood on where the XF 56mm F/1.2 does not. The XF 56mm F/1.2 will require less flagging in a studio environment. The XF 56mm F/1.2 has been more prone to flare during sunny outdoor shooting in my experience, but it’s not bad enough or ugly enough for me to consider adding so much size to the lens with the hood. For commercial work, sure, I’ll use the hood. For walking around though, the hood will always stay home. A second 62mm Nikon lens cap was ordered to replace the more fiddly Fujifilm cap on the XF 56mm F/1.2. Sadly, a genuine Nikon cap isn’t an option for the tiny, and even more fiddly 39mm cap for the XF 60mm F/2.4 Macro (the fake Nikon caps don’t compare). The tiny cap is next to impossible to remove with gloves. I’ve thought about buying a clear filter and just leaving it on, but then I’m bringing a piece of glass right out to the front of the lens, which is just begging for flare. I often like real flare from the lens, but I don’t want to add it with a filter. The aperture ring on Fujifilm lenses has been a point of contention for me. There are major differences from lens to lens on how the aperture rings feel. They tend to err on the side of being a little too loose, and some feel like a brisk wind might knock them to a different aperture. While I’ve noticed the aperture ring not wanting to stay seated at f/1.2 on one 56, thankfully all the copies I’ve handled have had a similarly good amount of clickiness to them. This makes two lenses in a row now (the 23mm f/1.4 has also been good) that have had consistently good aperture rings so hopefully Fujifilm have left the variances behind them. The 60mm f/2.4, on the other hand, was one of the earlier releases and that shows in how stiff the aperture ring is on it. Of the three original primes (the 18mm f/2, 35mm f/1.4, and 60mm f/2.4), the 60mm has the tightest ring by far with the 18mm having the loosest. Both copies of the 60mm f/2.4 I’ve handled had very tight aperture rings. It feels little bit rough when it’s turned, but there is no way you’ll accidentally knock that ring out of place. The focus ring is another place where the FUJINON XF 60mm f/2.4 Macro is a little rough. It reminds me a little of Nikons’s pro zoom focus rings. You can really feel it as it turns. It’s also tight and by the time it gets to minimum focusing distances, it takes a lot of turns to move the plane of focus. For a macro lens, this is a good thing. For anyone buying it as a portrait lens, it could get tedious. 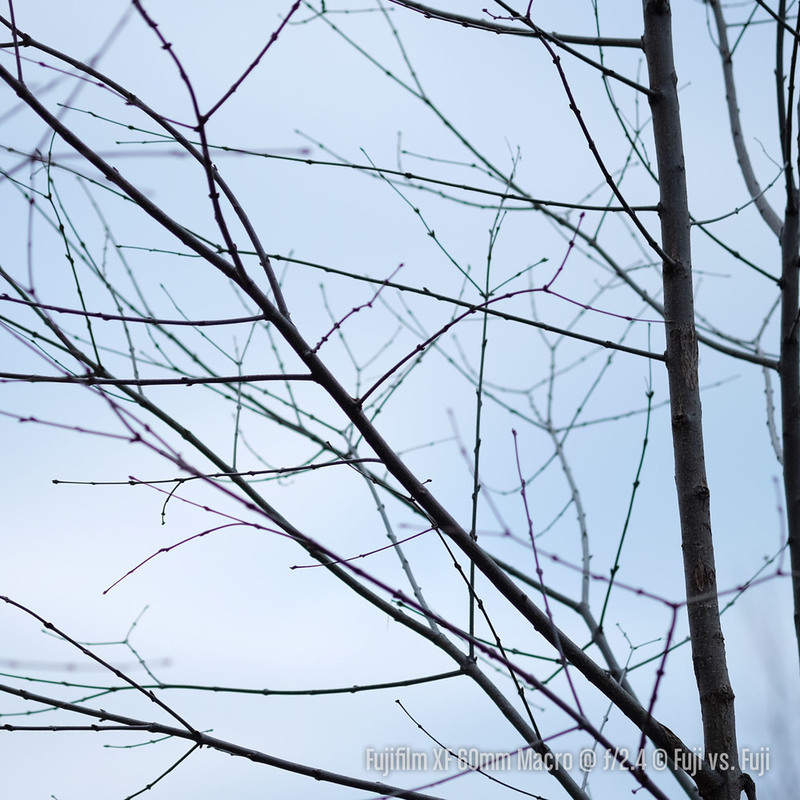 In my early review of the 56mm f/1.2, I sort of gushed about its focus ring. Thankfully, the focus ring on my production unit is also nice and smooth. There’s a weird characteristic when you turn the ring back and forth where you might feel it get momentarily looser, but in practice, you’d never turn the ring this way so I’m not bothered by it. On the topic of focusing, the 56mm f/1.2’s elements stay put on the outside while as mentioned, the 60mm f/2.4 Macro’s barrel protrudes in a weird sort of phallic way. The barrel keeps the front element nicely recessed though, making it virtually impossible to scratch. I’ve already accidentally smudged my fingers on the 56mm f/1.2’s huge front element. Outside of maximum aperture and price, this is the biggest difference between the lenses. The 60mm f/2.4 is really not a whole lot bigger or heavier than the 35mm f/1.4. 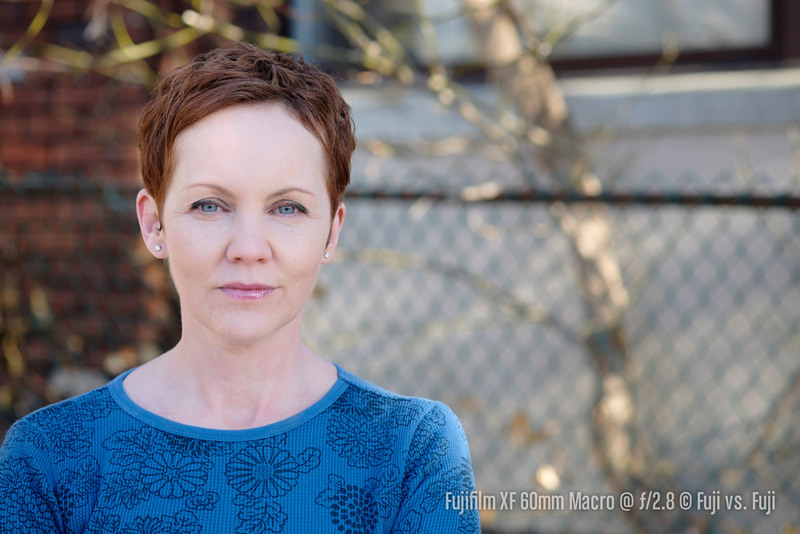 The FUJINON XF 56mm f/1.2 actually make the 23mm f/1.4 feel sort of small. It’s a big lens and a heavy hunk of glass. That’s what f/1.2 gets you. It’s a little awkward on the X-E cameras, and balances better on an X-T1, especially with the vertical grip. That’s not to say you should look away from the 56 if you’re an X-E1 or X-E2 shooter. When actually shooting, the ergonomics of the combo are actually excellent. The 60mm f/2.4 balances well on any X-Trans body you can buy these days. It would be pretty front-heavy on an X-A1 or X-M1 with the hood, but otherwise should be fine. The 56mm f/1.2 comes with a 62mm filter thread making it an ideal mate for the 23mm f/1.4 as it shares the 62mm filter size. Unfortunately the 60mm f/2.4 Macro has a weirdly small 39mm filter thread. This makes buying filters for it economical, but it would have been great if it shared the same 52mm filter size as the 18mm f/2 and 35mm f/1.4. That way one set of filters could cover a huge focal range from 3 small, lightweight, and inexpensive lenses. Here’s where your money starts buying you more. 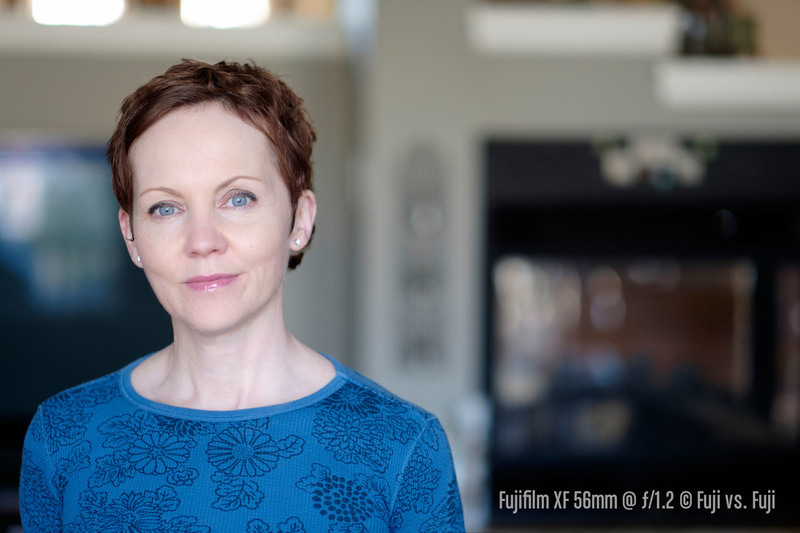 Without doubt, the FUJINON XF 56mm f/1.2 focuses faster on the X-E1, X-E2, and X-T1. It’s perfectly usable, to great, to excellent respectively. The 60mm f/2.4 on the X-T1 focuses at about the same speed as the 56mm f/1.2 on an X-E2. On the X-E1 the 60 starts to really slow down, and it can sometimes miss focus, then drag itself kicking and screaming through it’s entire focal range before proudly displaying a red “can’t focus” box. Honestly, if you’re shooting in lowlight, the 60mm f/2.4 on an X-E1 will frustrate you. Then again, if you’re shooting in lowlight often, you owe it to yourself to have a look at the X-E2, at least. As far as Continuous AF is concerned, I had pretty good success with the pre-production unit of the 56mm f/1.2 with an X-T1. Less so with the X-E2, which is to be expected. Nothing about the 60mm f/2.4 is built for Continuous AF so I haven’t even tried it. I did have a number of cases in my testing where the 60mm f/2.4 appeared to have locked focus, but upon reviewing my images, I see that the initial autofocus on the 60mm f/2.4 missed completely. This is a shame since it cost me a fair bit of testing time, but it would be even worse of these images really mattered. I’ll have to keep tabs on this phenomenon. I’ve done a few sharpness comparisons so far using different subjects to show fine detail, edge-to-edge performance, and sharpness at infinity. I shot this subject for the next round of my Film Simulation comparison, and I figured it would also make a nice edition to the 56mm f/1.2 vs. 60mm f/2.4 article. Focus was on the pig’s eye, so in the first image at least, you’ll notice his nose falling out of focus, particularly on the 60mm f/2.4. I kept these shots to equal apertures, starting with f/2.8. One thing that keep surprising me is how big a difference that 4mm makes. The 60mm f/2.4 gets you noticeably closer. At f/2.8, I have to hand it to the 56mm f/1.2. It’s not really a fair fight since it’s already stopped down quite a bit where the 60mm f/2.4 is pretty close to wide open. 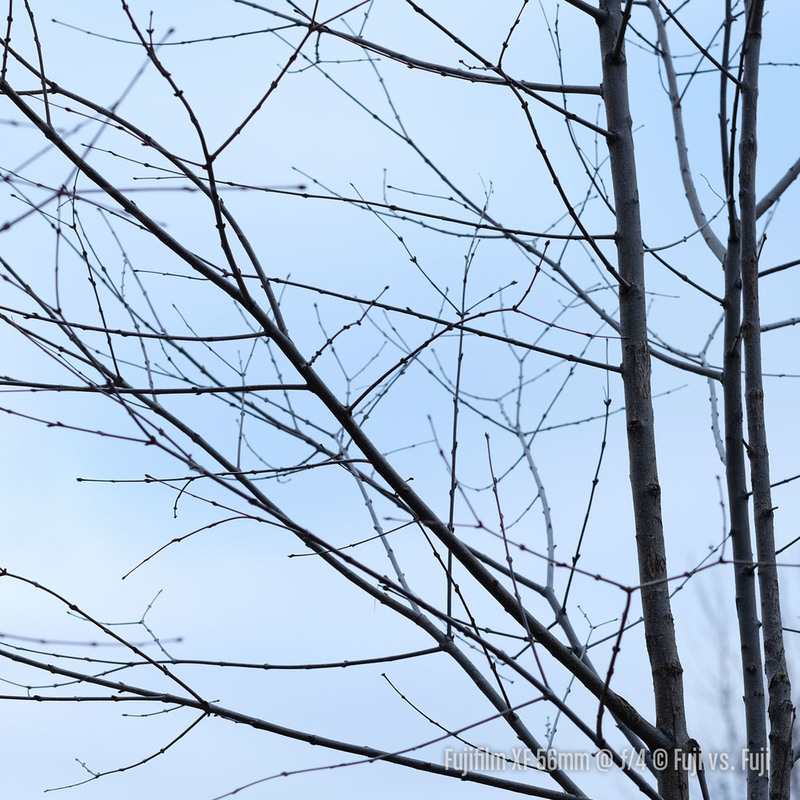 By f/4, things balance out a little, but the 56mm f/1.2 is still holding more detail and is more constrasty. The trend continues at f/5.6. This appears to be the 56mm f/1.2’s sharpest aperture. Interestingly, by f/8, the 60mm f/2.4 closes the gap almost entirely. I’m seeing a little bit of diffraction setting in on the 56mm f/1.2 at f/8 while the 60mm f/2.4 has gotten sharper. I call it a tie at this aperture. This test confirms that for maximum sharpness at large apertures, the 56mm f/1.2 is your lens. However, if you’re looking to shoot up into f/8 and f/11 for more depth of field or even landscapes, the 60mm f/2.4 is definitely worth looking at. This test is an excellent gauge to see what aperture for each lens delivers maximum sharpness, and where diffraction starts to set in. It stands to reason that it would be at smaller apertures on the 60mm f/2.4 given it is a macro lens, but it’s remarkable how far the lens can be pushed before diffraction gets too ugly. I guess one could call this “micro contrast.” The larger details in the images from the 60mm f/2.4 Macro appear to have more contrast, but when you inspect closely, the 56mm f/1.2 seems to hold more fine detail. This could explain why at f/8 the Angry Birds appear sharper. 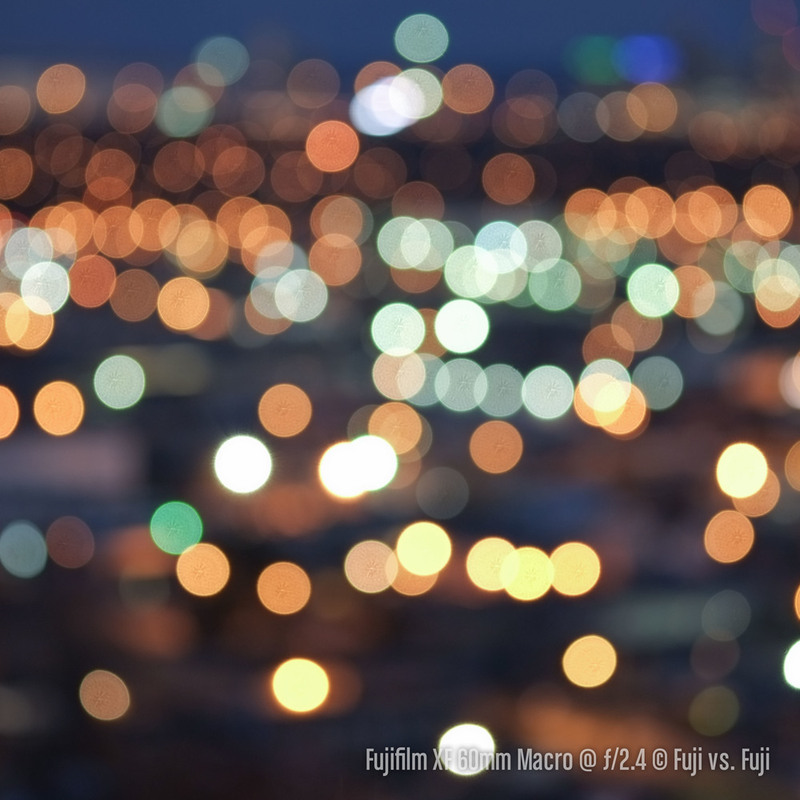 By f/11, diffraction starts to make itself seem on the 56mm f/1.2 while the 60mm f/2.4 is reaching maximum sharpness. At f/16, the 56mm f/1.2 starts getting soft. Diffraction makes a bit of an appearance on the 60mm f/2.4, and sets in heavier by f/22. 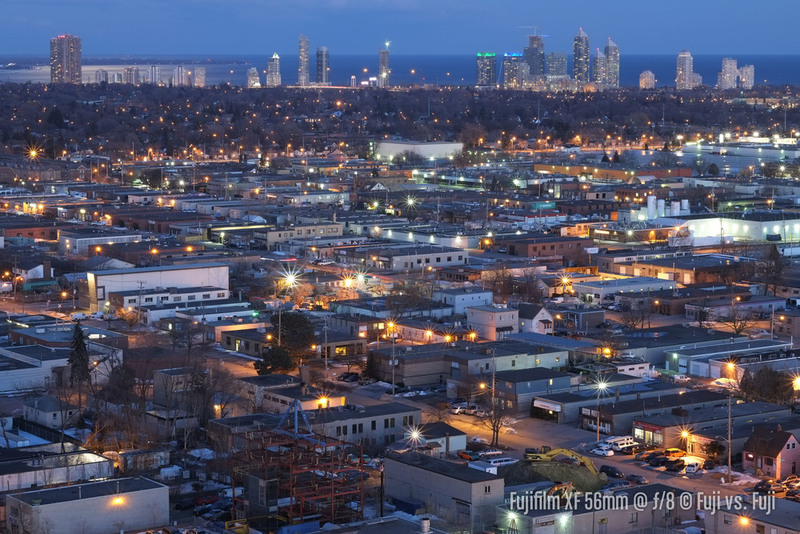 This next round of images was shot from the 27th floor of a condo. 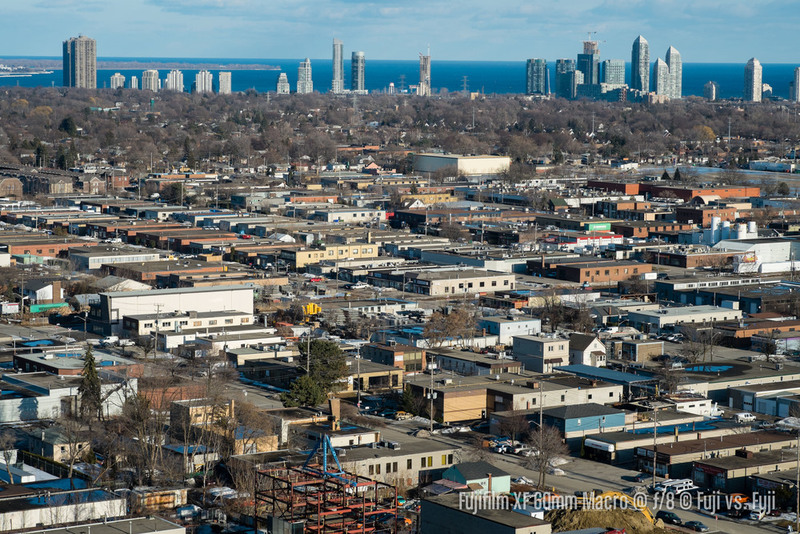 The buildings in the very most background are actually the buildings from the previous set of images. This small group is to give you an idea of how the lenses perform at infinity. I’ve added the FUJINON XF 18-55mm f/2.8-4 in for good measure and only shot at f/5.6 and f/8. These are very detailed images so the file size it quite large. Click the enlarge. It’s a bit of an unfair fight between the zoom and the primes. The edge to edge sharpness of both primes is astounding. 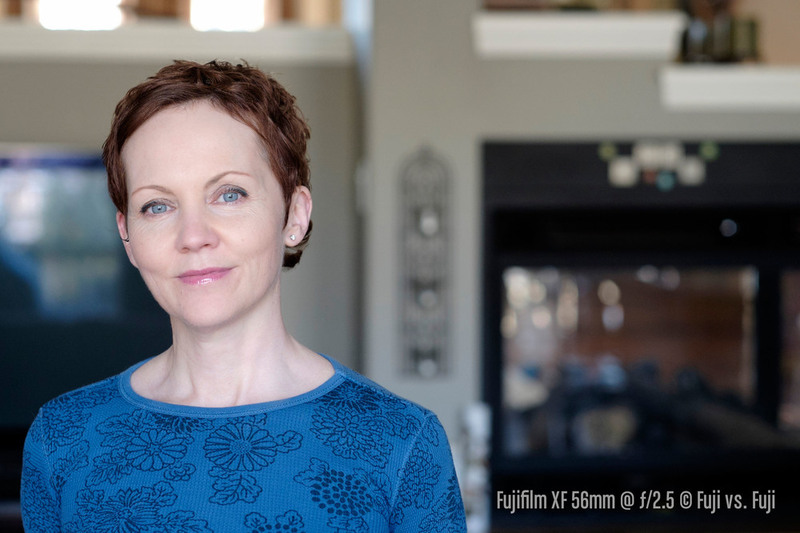 This is getting to be unsurprising for Fujifilm as at least the FUJINON XF 35mm f/1.4 and FUJINON XF 14mm f/2.8 have performed just as well right out the the edges. 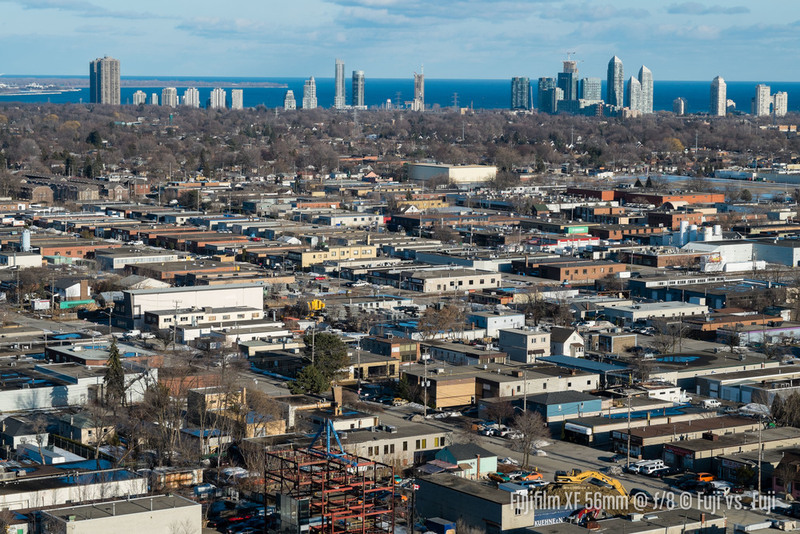 The 35mm f/1.4 also blew the 18-55mm out of the water in my comparison of those lenses. With the zoom out of the way, the 56mm f/1.2 once again is holding more detail overall at f/5.6, but the 60mm f/2.4 isn’t too far behind. 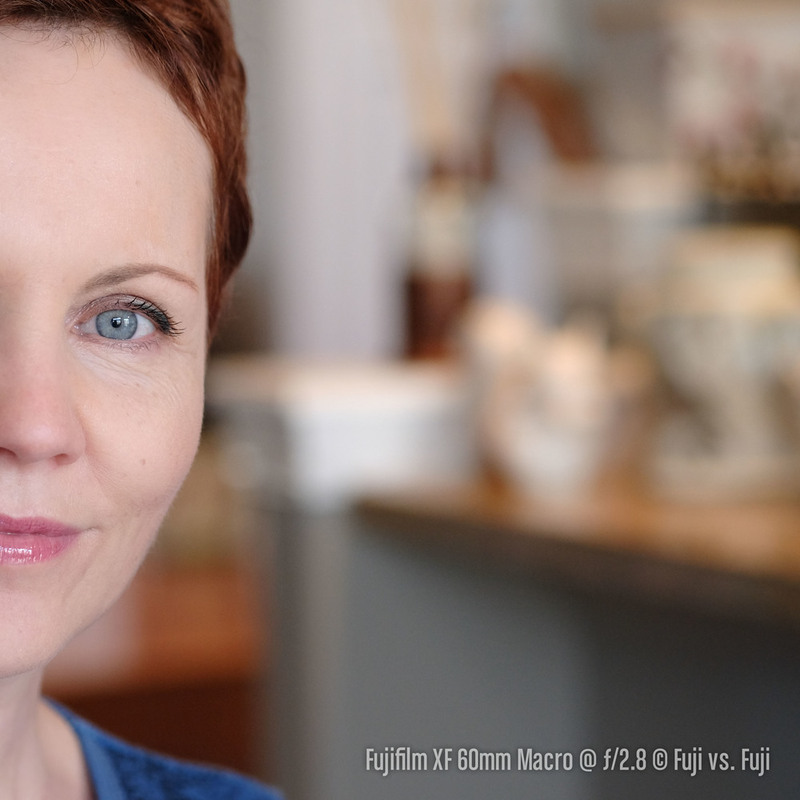 By f/8, the 60mm f/2.4 closes the gap, but the 56mm f/1.2 still appears sharper, again those fine details. The 18-55mm gets a little bit better, but it’s still noticeably softer, especially towards the edges and corners. This is probably where most of you scrolled to, but before we get to bokeh, I just want to mention the rendering of each lens. The 60mm f/2.4 appears to render images a little bit warmer than the 56mm f/1.2 does. I first noticed it on the green of the pig up in the Sharpness tests. If you’re shooting RAW, this isn’t a big deal, but for the JPEG shooters out there, the warmth of the 60mm f/2.4 is worth noting. Just a small note though. 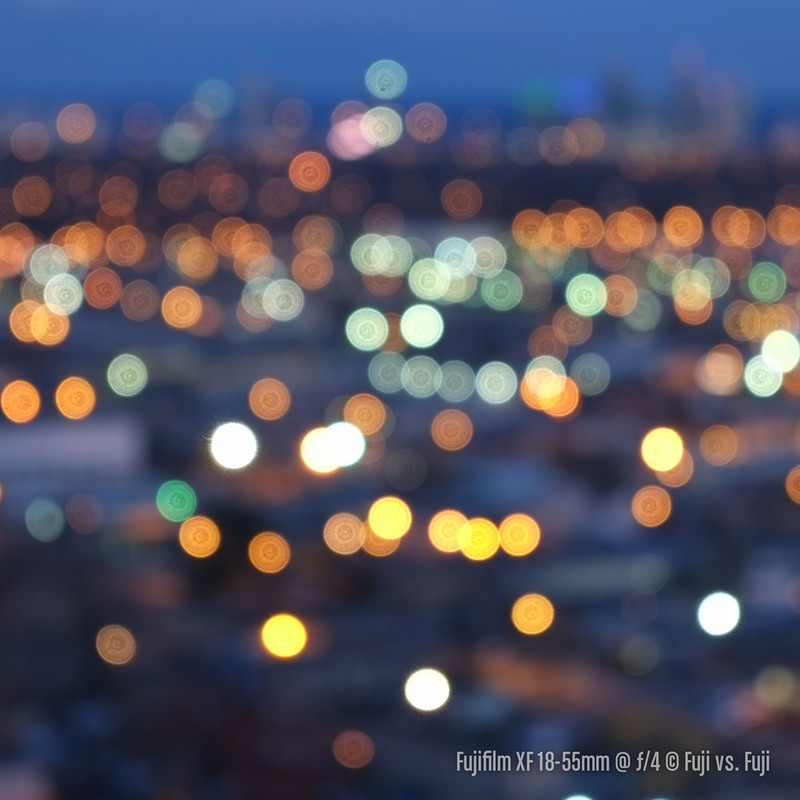 Ok, on to bokeh. Unfortunately the poor weather hasn’t let up so I’ve had to be crafty with finding suitable test subjects around the house. I hope to add more outdoor scene as the weather permits. The first test is a series of 5 candles. Focus is on the wick of the second candle from camera. The background is a dining room table with a wine bottle on it. First, the 56mm f/1.2 at f/1.2 and f/1.4. For some reason, with the lens set at f/1.2, I find the camera underexposes slightly. In addition, to my eye, the bokeh at f/1.4 is actually slightly smoother. I don’t detect a significant difference in sharpness between the apertures, however. The combination of the slightly smaller aperture and the slightly wider focal length of the 56mm f/1.2 is adding up to smoother bokeh on the 60mm f/2.4 Macro when shooting from these distances. More of the same. It appears that at the same focus distance, the 60mm f/2.4 Macro actually produces smoother bokeh in this instance. The 56mm f/1.2 also has more heptagonal bokeh balls. Speaking of bokeh balls, here’s a quick comparison of the two lenses plus the 18-55mm defocused to get bokeh balls of roughly the same size. The 18-55mm is pretty brutal so we’ll take it out of the conversation. Beyond that there is little doubt that the 56mm f/1.2 produces superior bokeh balls. 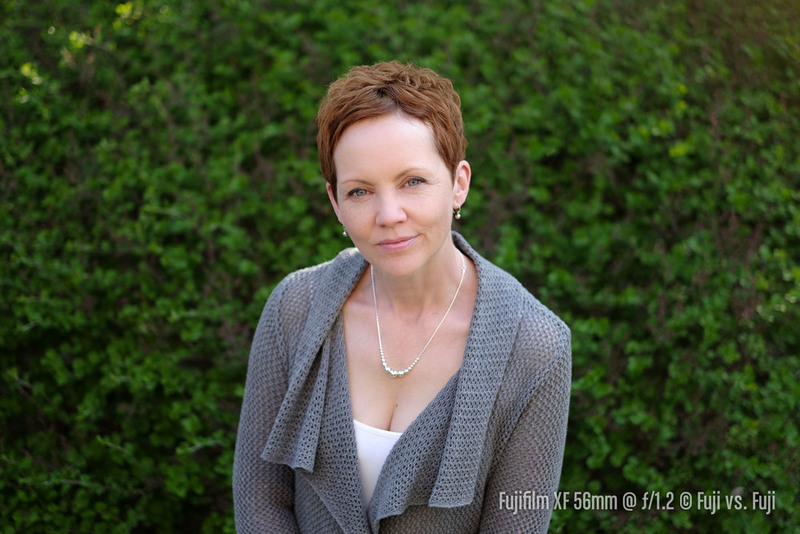 As mentioned, the 56mm f/1.2 is significantly more prone to flare because of that huge, exposed front element. Let’s have a quick too at how the flare from each lens is rendering by shooting directly into the sun. For these images I shot each at f/2.8, as well as their smallest apertures for maximum sunstar goodness. Click to enlarge. There’s not a huge difference to my eye, with the exception of a couple more light blobs on the 60mm f/2.4 Macro at f/22. The sunstar produced by the 56mm f/1.2 at f/16 is more distinct and pleasing. At the very bottom of the frame, you can make out a nice secondary sunstar from the specular highlight on the car too. What’s a portrait lens comparison without any portrait shots? Fortunately, my beautiful wife was patient enough with me as we tried to find decent backgrounds for her to stand in front of in this hopelessly grey and dreary season that’s masquerading as spring. So, not unlike the bokeh tests, we found some places around the home. I did a couple options standing in the same place while switching lenses to give an idea of how framing changes, and then one where I moved to reframe the images similarly. In some cases, the lead eye is intentionally not the eye in focus to make the crops better, but one thing I did learn is that at f/1.2 and f/1.4, the 56mm f/1.2 has extremely narrow depth of field at it’s closest focusing distance. Eyeballs can be in perfect focus with eyelashes out of focus. This is one thing that can’t be achieved with the 60mm f/2.4 until you get into macro distances. These images show the 56mm at f/1.2 and f/1.4 first, followed by the 60mm wide open at f/2.4 to give you an idea of the difference the larger aperture makes. The answer is quite a bit. Now again, the reason for showing both f/1.2 and ƒ/1.4 is aside from the extra light gathering the extra ⅓ stop gives you, there seems to be very little benefit to shooting wide open. As we saw earlier, the bokeh is actually slightly smoother. Both have smoothed out that crappy background much better than the 60mm f/2.4 has. We’re seeing that warmer rendering of the 60mm f/2.4 coming through again too. In this case, I prefer how the 56mm f/1.2 has handled my lovely model’s skin tones. Here are 100% crops. Click to enlarge. Next we’ll compare the lenses head to head at the widest aperture they both share, f/2.8, followed by crops. You’ll start to see a little noise coming in on these images as they were shot indoors and auto ISO was pushing things up to 1,250 in order to keep the shutter speed fast enough. I do find the 56mm f/1.2 is a bit sharper as we’ve seen in the other tests, but it seems less obvious and less critical in a portrait session. The bokeh is ever so slightly smoother on the 56mm f/1.2 as well, but one thing this exercise has shown me is I prefer the compression of the 60mm f/2.4 over the 56mm f/1.2. It’s just a little more flattering. 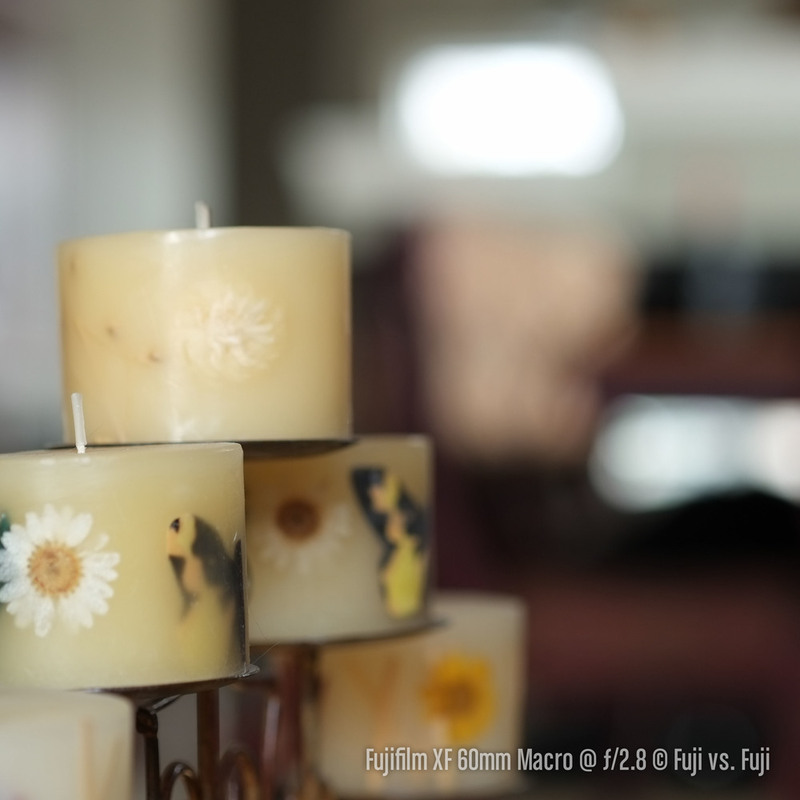 Once again, the 56mm f/1.2 at f/1.2 and f/1.4, followed by comparisons. Click to enlarge. You get a really good sense of how much closer the 60mm f/2.4 Macro gets you. 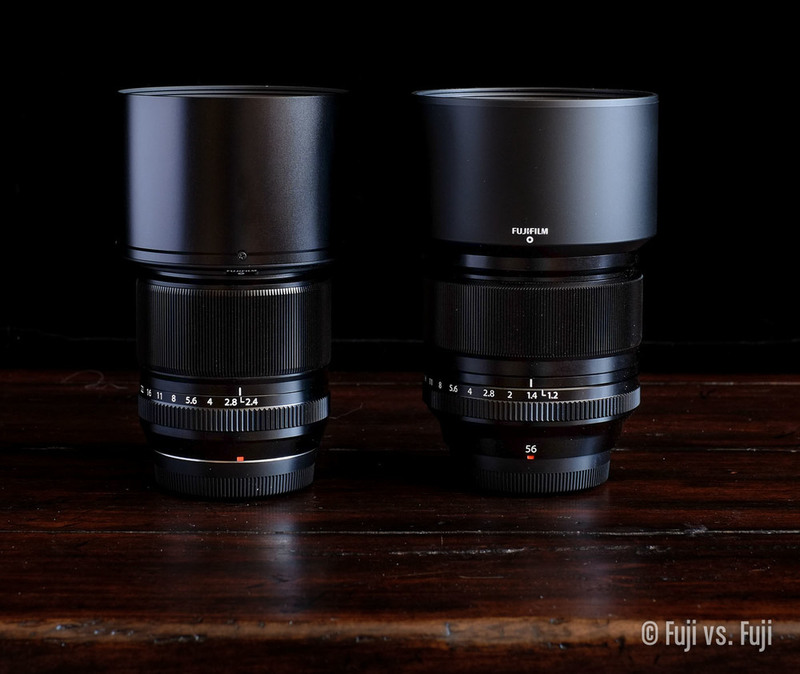 This comparison also illustrates the slightly cooler rendering of the 56mm f/1.2. We managed to get one decent set of outdoor shots before the heavy coat had to go back on. This comparison shows a very busy, messy background and how much it melts away with the two lenses. Unfortunately the camera grabbed focus just behind my wife’s eye in the first 60mm f/2.4 Macro image. It’s clear that the larger aperture of the 56mm f/1.2 allows for much greater separation from the background, even from the same shooting distance. And again, the warmth of the 60mm f/2.4 Macro is coming through. Quite a few people have asked how the 56mm f/1.2 compares to the 18-55mm at maximum aperture. I’ve been intending to capture a better example, but the images below illustrate how much more background separation can be achieved at f/1.2 compared to f/4. Note that this background is only about a half a meter away. The results of this section should be readily apparent, but it’s still almost comical how bad the 60mm f/2.4 beats the 56mm f/1.2. Any lens with the name “Macro” in its name should perform fairly well in close focusing, and yes, the FUJINON XF 60mm f/2.4 Macro takes the 56mm f/1.2 to school in this category. If you want to focus close, the choice is pretty clear. It’s pretty close... I guess. Overall, this stuff is less important to me since a good amount can either be fixed in camera, or in post. I thought it might still be of interest though and there’s at least one comparison where things can’t be repaired in post. We’ll start with that one. This is the effect wide apertures often have on smaller points of light. They can smear. I added the 18-55mm to this test as the power of primes is really evident here. I’ve shown two images per lens, wide open and stopped down to f/8 where the points of light should sharpen right up and maybe even create nice little stars. 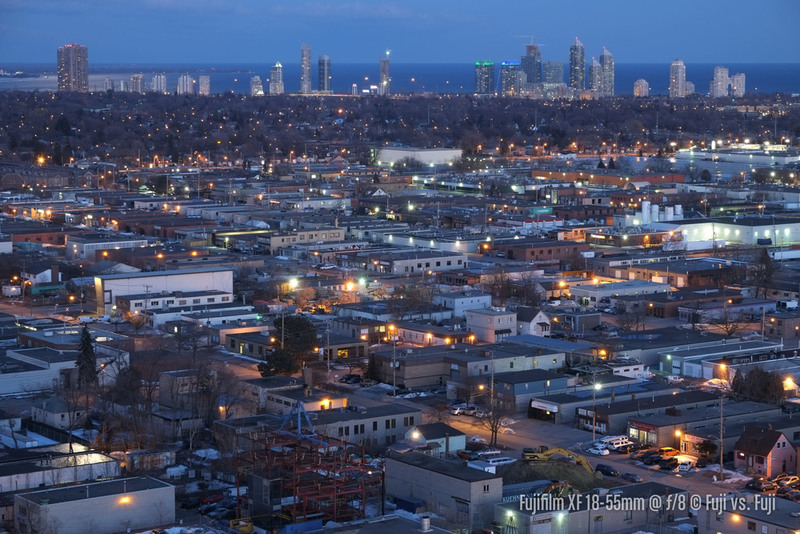 These were shot from the 27th floor of a condo, focus was towards the bottom of the frame, but we’re well into infinity territory here except maybe the 56mm f/1.2. Click to enlarge. Wide open it’s sort of a toss up as far as the lights are concerned. It’s interesting that the 56mm f/1.2 has rendered Fluorescent lights a cooler blue colour whereas the 60mm f/2.4 and 18-55mm have rendered them green as we’d expect. I’m not sure how to explain that. As far as sharpness is concerned, the 56mm f/1.2 gets the nod wide open for me, followed closely by the 60mm f/2.4, which is then closely followed by the 18-55mm. The humble kit lens holds its own, but can’t keep pace with the primes. Again we notice the slightly cooler rendering of the 56mm f/1.2 compared to the warmer 60mm f/2.4. The 18-55mm is cooler still. And finally, the pincushion distortion of the 18-55mm is readily apparently in these images. The primes show very little distortion; that horizon is kept very straight. By f/8, the prime advantage becomes clear. Sharpness follows the same order here with the 56mm f/1.2 being the sharpest and most contrasty. The more noticeable advantage with the primes is the lights are rendered with beautiful starbursts while the zoom lens still shows balls of light. My preferences is the more distinct starbursts of the 56mm f/1.2, but the 60mm f/2.4 isn’t bad. The 18-55mm is quite poor. Here are closer crops so you can get a better idea of how much nicer the primes render the lights at f/8. This is much less important in my opinion, but let’s have a look at how the lenses handle CA anyhow. Click to enlarge the gallery for a much better look. I’ve followed a similar order here as with the sharpness tests. The 56mm at f/1.2 and f/1.4, followed by the 56mm f/1.2 and 60mm f/2.4 Macro at f/2.5 and f/2.4 respectively, then each lens at f/2.8, and f/4. The first thing I notice is just how different the lenses are rendering the blue, grey clouds and sky. The 56mm f/1.2 is far more saturated and cool. I can’t quite get over the difference to be honest. Keep in mind that these images were shot within minutes of each other—seconds between the last 56mm image and the first 60mm—using the exact same camera with the exact same settings. As far as chromatic aberration is concerned, things are pretty much what I expected aside from hoping the 56mm f/1.2 would perform a little better. At f/1.2 and 1.4, the fringing is fairly pronounced, and it cleans up nicely by f/2.8 and up. The 60mm f/2.4 Macro performs much better wide open, but slightly worse than the 56mm f/1.2 at ƒ/2.5. Even at f/4, there’s still a small amount of CA on the 60mm f/2.4 Macro. The 56mm f/1.2 wins this test. While these lenses are fairly close in focal length, they are clearly built for different purposes. I’ve been waiting for a portrait lens for almost a year now, ever since I sold my Nikon 85mm f/1.4 AF-D. 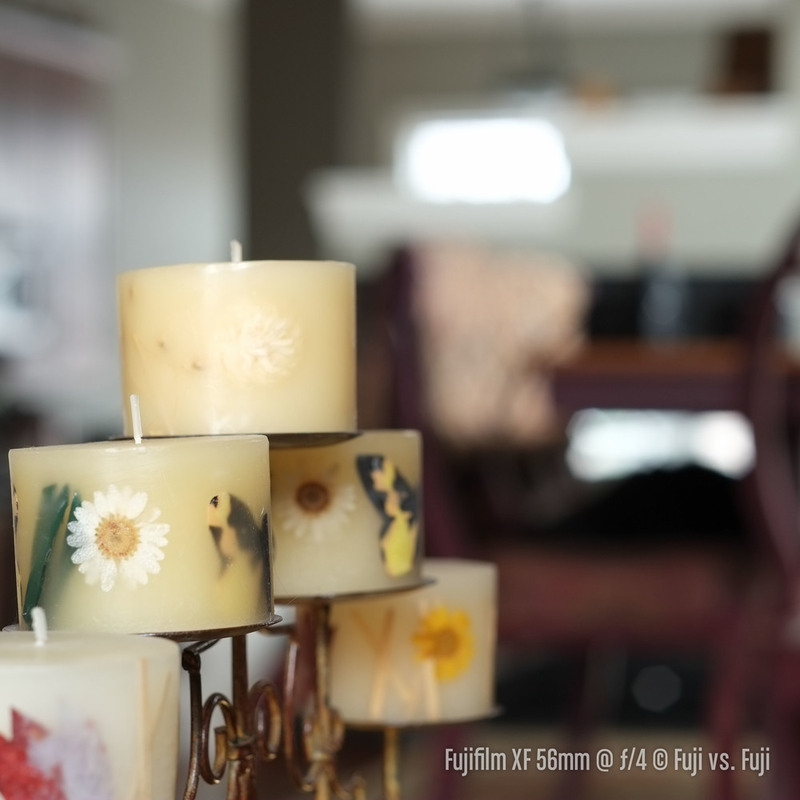 The FUJINON XF 56mm f/1.2 fills that void admirably aside from the true focal length difference, and is actually usable out to the edges of the frame unlike the Nikon. Finally I can get back to portrait work. The FUJINON XF 60mm f/2.4 Macro seems built for carefully considered images and precise focusing. 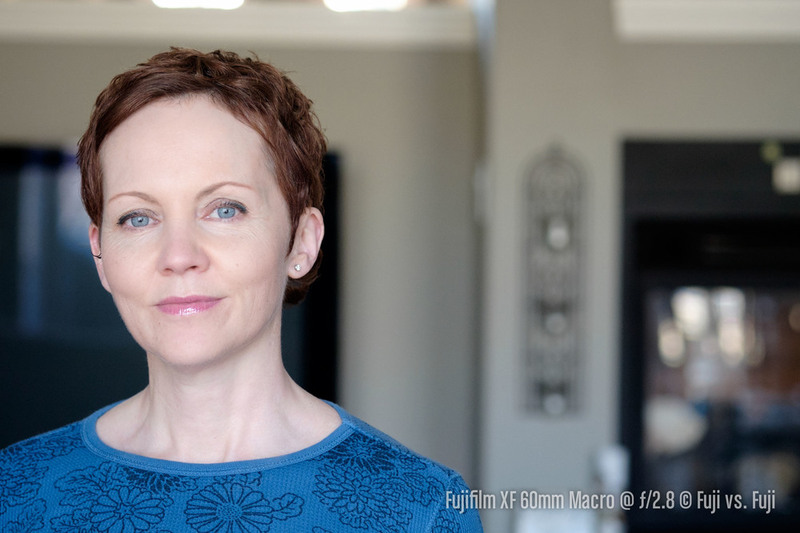 It was always sort of a stop gap for Fujifilm shooters wanting a flattering portrait lens, and it still is the prime to beat for most flattering focal length in my view. It’s a very good lens and does what it does well, but it’s not a dedicated portrait lens, nor was it ever intended to be. I always figured I’d borrow a 60mm f/2.4 for this comparison, but with the support of my awesome readers, I was able to afford to buy one, and I’m happy to have it. Not only so I can continue testing and adding to articles like these, but macro work is something I haven’t had a chance to do much of and the 60mm f/2.4 is a great starting point. I can also see myself packing it instead of the 56mm f/1.2 for landscape shooting since it’s so much lighter and very sharp edge to edge. 39mm filters aren’t exactly expensive either. Well, if you want to shoot a lot of portraits, need fast focusing, or you’re a shallow depth of field nut, the answer is obvious, you want the 56mm f/1.2. If you want a more versatile, lighter, smaller lens that is a little slower in every way, but costs just over half as much, the FUJINON XF 60mm f/2.4 Macro is an excellent option. It’s truly a really tough call. The 56mm f/1.2 is a better lens in almost every way, but at $400 more, you could just about add a second lens for that. I’d be tempted to take the 60mm f/2.4 Macro and the 18mm f/2 or 35mm f/1.4 over the 56mm f/1.2 for not much more money. It also depends which camera you have. I would want the focusing speed of at least an X-E2 in order to get on with the 60mm f/2.4 Macro. Otherwise it would definitely get frustrating unless precision macro work is your reason for buying it of course.